3726 70 3 C. Yellow brown on yellowish, fresh colors and in perfect condition unused with original gumming. Michel 240,- €. 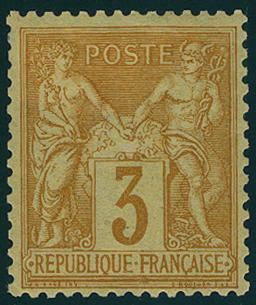 3727 / 82 75 C. Allegory 1879, wonderful block of four fresh colors and in perfect condition unused, the lower pair even mint never hinged Michel for unused single stamps 1000,- €. 3728 99x 2 Fr. 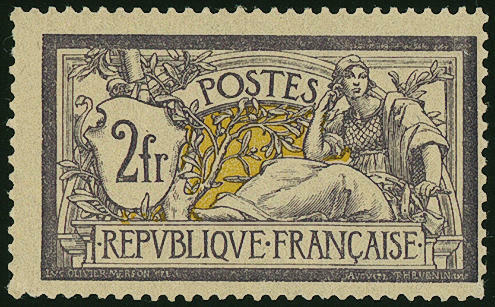 Violet / yellow, type Merson, wonderful fresh colors and very well perforated, in perfect condition mint never hinged without any signs. A dreamlike nice outstanding quality this France rarity! Maury 2600,- €. 3729 99x 2 Fr. 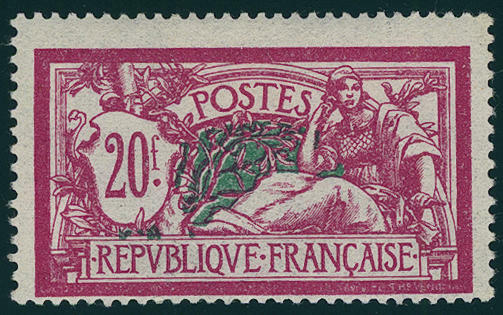 Allegory 1900, fresh colors and very well perforated, in perfect condition mint never hinged in utterly perfect condition, without any signs. An outstanding quality for the highest standards! Maury 2600,- €. 3730 99x 2 Fr. Merson, fresh colors and very well perforated, in perfect condition unused, expertized Buehler. Michel 900,- €. 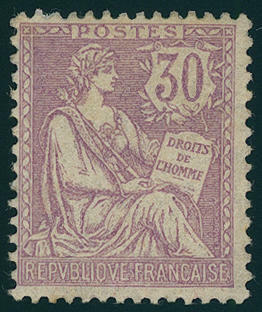 3731 106 30 C. Pale violet, fresh colors and in perfect condition mint never hinged, expertized Diena. Maury 1000,- €. 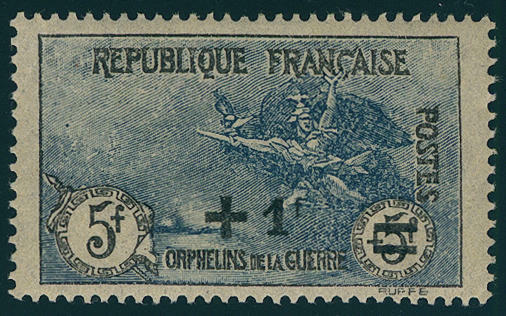 3732 / 128/35 War orphan 1917, fresh colors and in perfect condition unused, the 1 Fr. Even mint never hinged Michel 2500,- €. 3733 134 1 Fr. 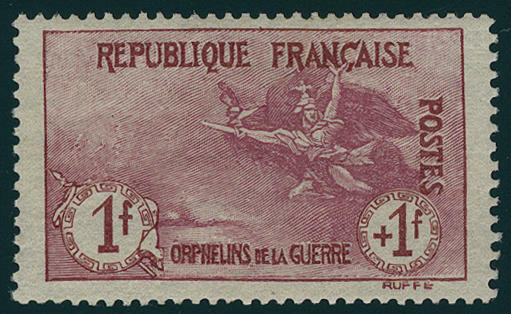 War orphan 1917, fresh colors and in perfect condition mint never hinged, without any signs. Maury 1600,- €. 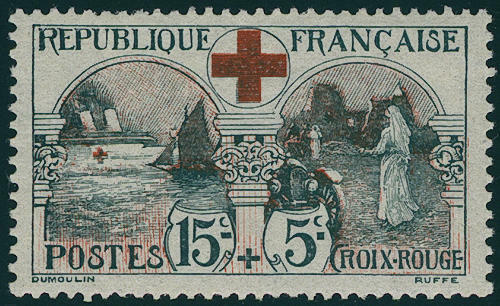 3734 136 Red Cross 1918, fresh colors and in perfect condition mint never hinged, without any signs. Maury 310,- €. 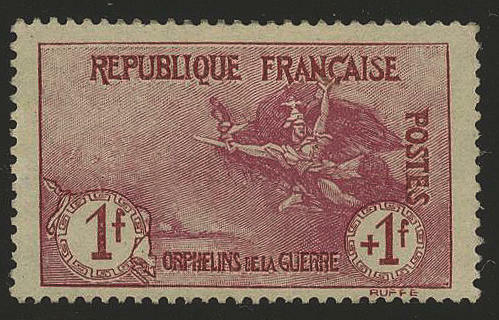 3735 144/51 War orphan 1922, fresh colors and in perfect condition mint never hinged Michel 380,- €. 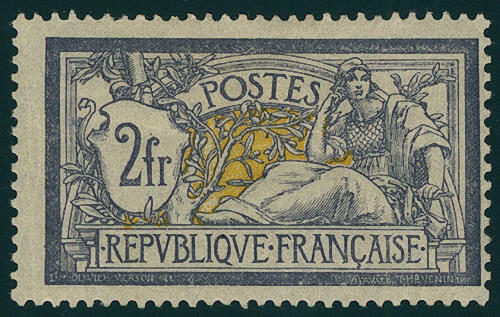 3736 152 Philatelic Congress 1923, fresh colors and very well perforated, in perfect condition mint never hinged, without any signs. Michel 650,- €. 3737 152 1 Fr. 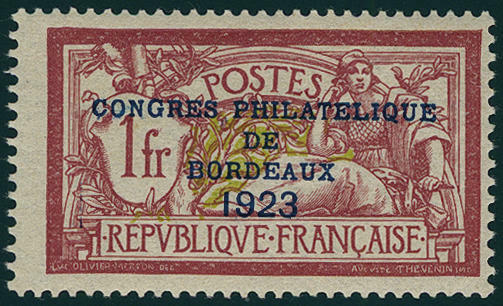 Bordeaux congress 1923, fresh colors and in perfect condition mint never hinged Michel 650,- €. 3738 181/83 3-20 Fr. 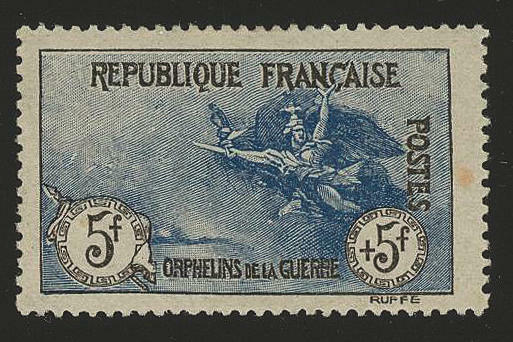 Allegory 1925 / 26, all three values fresh colors and in perfect condition mint never hinged, signed. Michel 700,- €. 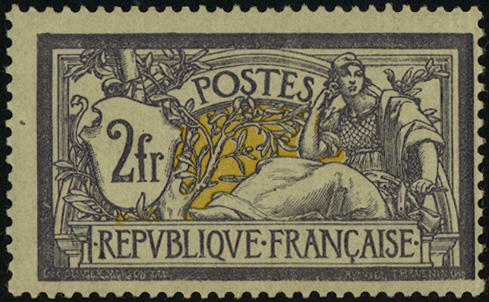 3739 214 5 Fr. 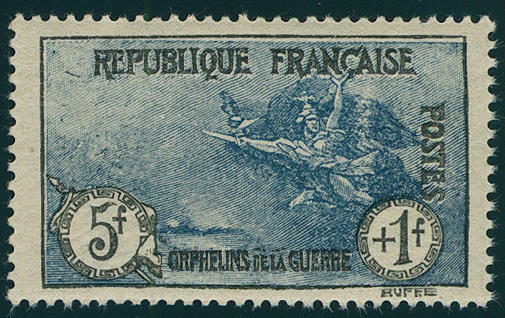 War orphan 1926, fresh colors, very well centered, in perfect condition mint never hinged Michel 180,- €. 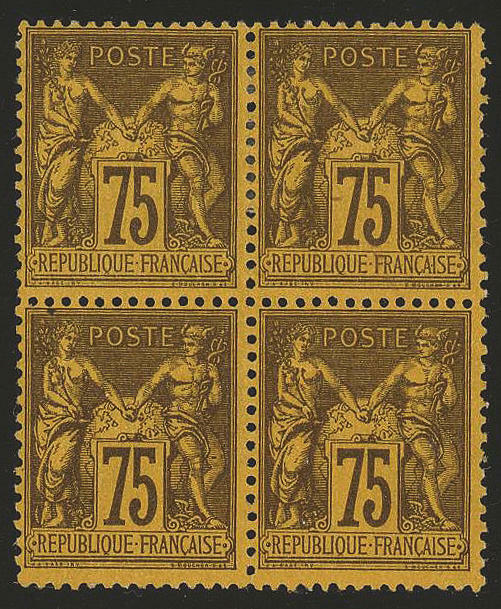 3739A Bl.2 Strasbourg souvenir sheet 1927, wonderful fresh colors and in full original size, in perfect condition mint never hinged, without any signs. A rare nice souvenir sheet in outstanding quality! Yvert 3000,- €. 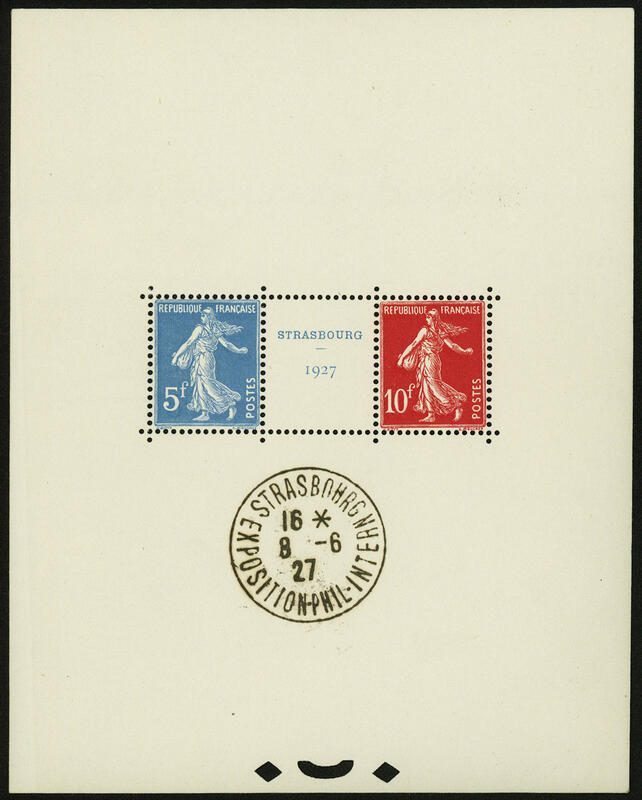 3740 Bl.2 Strassburg souvenir sheet 1927, wonderful fresh colors in full original size, in perfect condition mint never hinged without any signs with clean exhibition special cancel in the sheet margin. An outstanding quality for the highest standards! Maury 1950,- €. 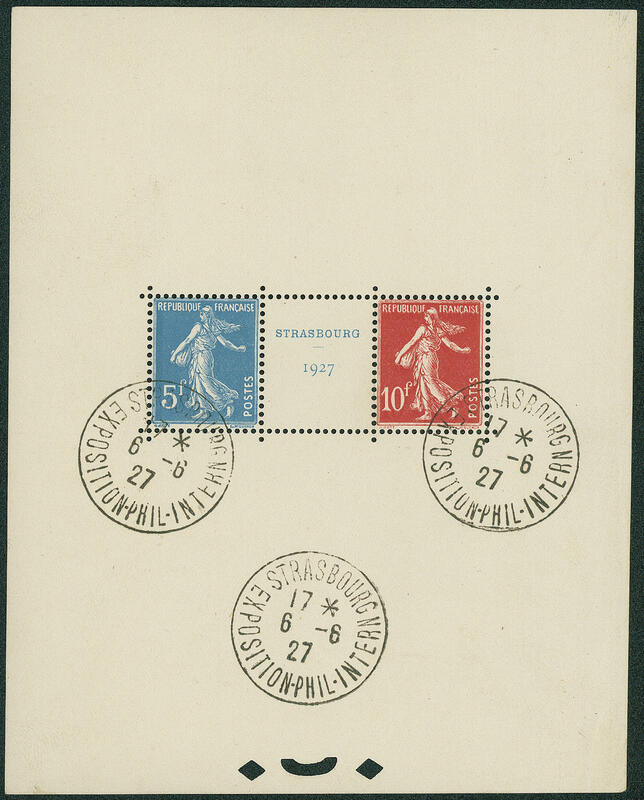 3741 ⊙ Bl.2 Strassburg souvenir sheet 1927, fresh colors and in full original size, especially nice canceled with the corresponding exhibition special cancel \"STRASBOURG 6.6.27. \". An exception copy! 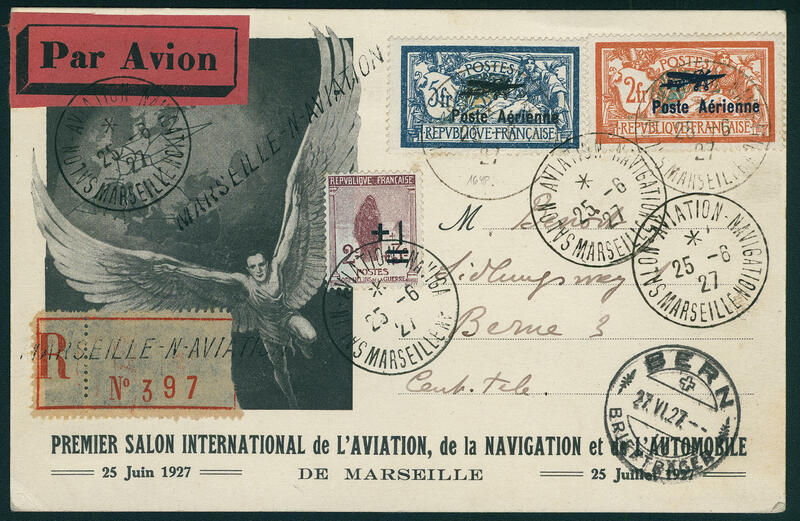 3742 ✉ 220/21 Airmail set 1927 in perfect condition with additional franking on very nice registered airmail postcard with special cancellation \"MARSEILLE 25.6.27. \" (first day! ) 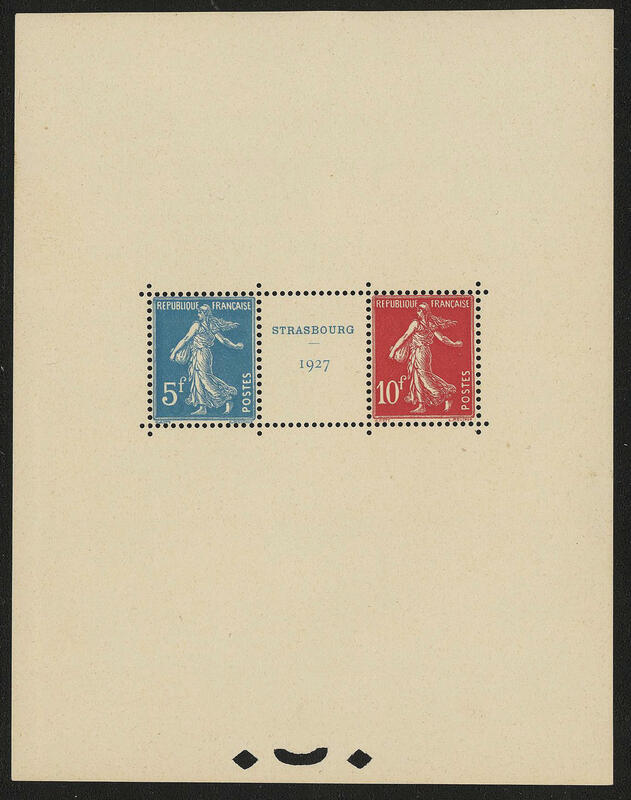 to Bern with arrival postmark. Very decorative! 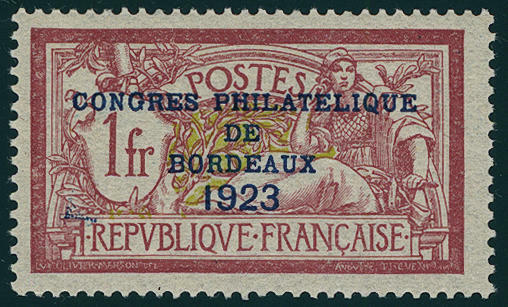 3743 239 2 Fr. 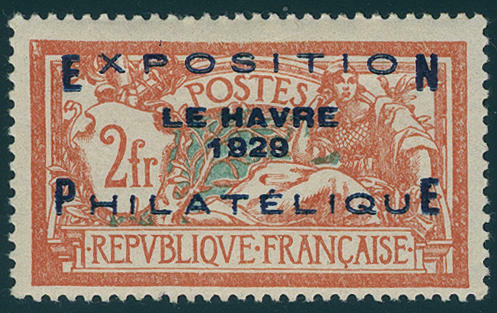 Exhibition Le Havre 1928, fresh colors and in perfect condition unused. 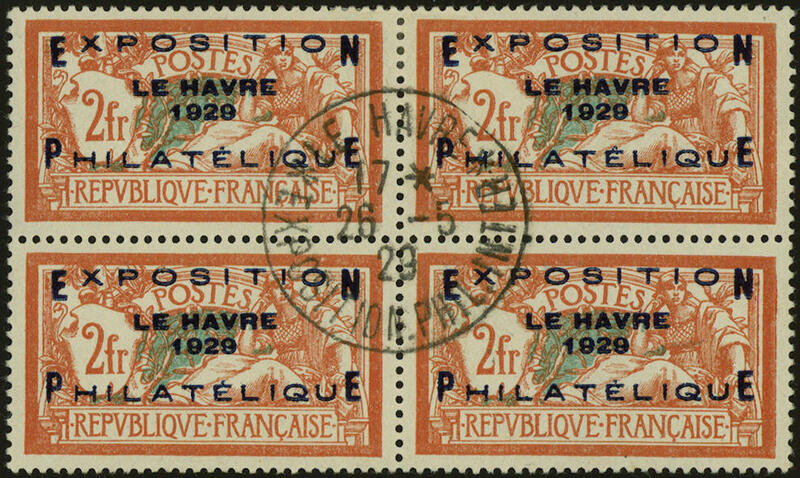 3744 ⊙ 239 Le Havre 1929, wonderful block of four, wonderful fresh colors, outstanding perforated and centered with especially beautiful clear centered exhibition special cancel \"LE HAVRE 26.5.29\". Connoisseurs piece for your highest requirements! Photo expertize from the Weid.